However, a newly released report confirms that the White House is not really interested in tax reform that helps “ordinary Americans”. Instead, under President Trump’s proposed tax cut plan, “ordinary Americans” will hardly benefit at all, as nearly half of Trump’s proposed tax cuts would go to people making more than $1 million annually, according to the report by the Institute for Taxation and Economic Policy (ITEP). “A tiny fraction of the North Carolina population (0.5 percent) earns more than $1 million annually. 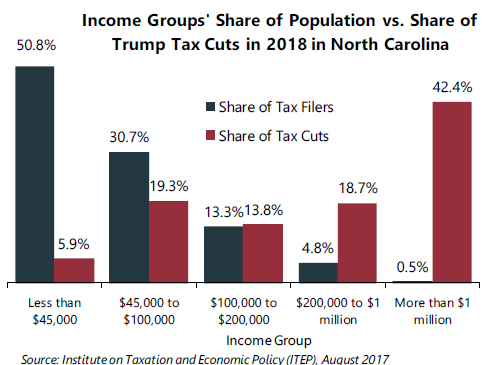 But this elite group would receive 42.4 percent of the tax cuts that go to North Carolina residents under the tax proposals from the Trump administration. 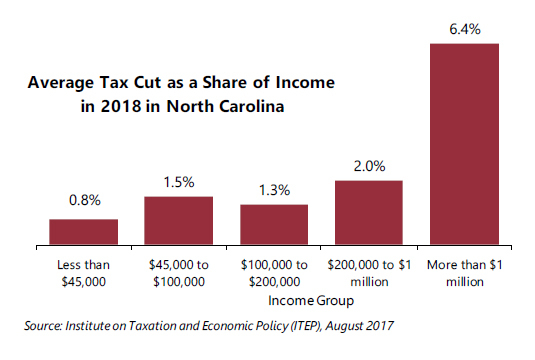 A much larger group, 50.8 percent of the state, earns less than $45,000, but would receive just 5.9 percent of the tax cuts. – Repeal of the 3.8 percent tax on investment income for the rich. – Repeal of the Alternative Minimum Tax. – Repeal of personal exemptions and doubling of the standard deduction. – Replacement of current income tax brackets with three brackets: 10 percent, 25 percent, and 35 percent. – Elimination of all itemized deductions except those for charitable giving and home mortgage interest. – Special tax rate (15 percent) for businesses that do not pay the corporate income tax. – New deduction and tax credit for child care. – Repeal of special tax breaks for businesses and reduction in the corporate income tax rate from 35 percent to 15 percent. – Repeal of the estate tax.